In this heartbreaking discussion during this special time of year, the “they” are the poor, long-suffering folks . . . at the Internal Revenue Service. It is a terrible, too-long-ignored scandal, which should tear at the heartstrings of every American. “Years of conservative attacks on the Internal Revenue Service have greatly diminished the ability of agency regulators to oversee political activity by charities and other nonprofits . . .” posits the recently published Post analysis. Apparently, it is all part of a scheme by “conservatives” to “scale back the IRS and shrink the federal government.” They write as if that were a bad thing. Oh, sure “conservatives” call it a “scandal.” But not the Post. Even though the IRS did indeed target Tea Party and conservative groups and frustrate, delay and thwart their most precious First Amendment rights to freedom of association and freedom of speech — in some cases for many years. Yet, the Post article does not seek to detail and decry this clear denial of constitutional rights, admitted to by the IRS. Instead, the paper zeroes-in on the “use” of this violation to mobilize a political check on the power — and budget — of the agency responsible: the Internal Revenue Service. Heavens, Washington is never supposed to work like that! Balancing bureaucratic power with legal limits? That actually borders on . . . accountability. 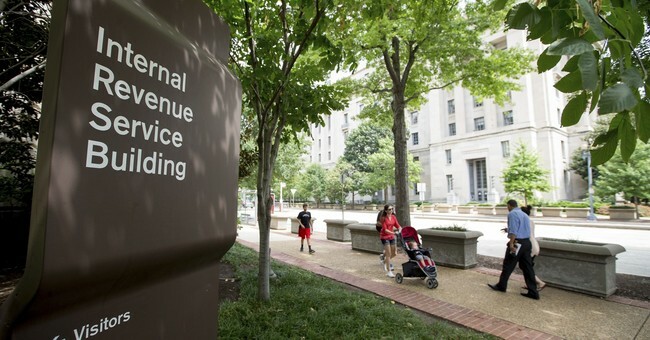 The budget for the offenders, the Exempt Organizations division of the IRS, was cut. No, not merely a reduction in the rate of increase, but an actual cut — from $102 million in 2011 to $82 million in 2016. This is good, not bad. It means the IRS is less likely to repeat this scandalous . . . episode. And note that the Post has no bloody shirt to wave, claiming the public has been ill-served by a leaner, but hopefully not meaner, IRS. It is unfortunately true that Lois Lerner, who headed the IRS division responsible during the epoch of its corruption and/or incompetence, avoided even a smidgen of accountability. After years of denying the targeting, she arranged to disclose it publicly. But then she refused to testify before Congress, asserting her Fifth Amendment privilege against self-incrimination. Lerner retired, instead, so taxpayers could begin paying her six-figure annual pension. From her days harassing conservative groups at the Federal Election Commission to her management of the IRS targeting of Tea Party groups, she has served the Deep State well. The lawsuits filed by Tea Party and conservative organizations against the IRS targeting have also now been settled with the federal government paying up big time. Sadly, it is with our money and without an apology, but as discussed earlier with perhaps some deterrent provided. Still, many on the left, in media and political circles, maintain, as the article states, that congressional and federal “investigators concluded there was no proof of political intent, a liberal conspiracy or White House involvement.” If certain groups are disfavored in exercising their basic political rights by sheer government incompetence — without regard to political intent or a proven conspiracy or White House involvement — it nonetheless remains a scandal. But, of course, it would not have been better had the IRS also taken special pains to hamper progressive or liberal or moderate political groups, making it harder for them to organize. Partisan political people and a partisan press seem to miss that point. To many, the IRS targeting of Tea Party and conservative and even some progressive groups is not a scandal. To me, that’s the biggest scandal of all.